A virtual guide to Mozambique. Get an overview of Mozambique's art, culture, people, environment, geography, history, economy and its government. Beside a country profile with facts and figures, this page offers maps, statistics, weather information, and links to sources that provide you with information about this Southeastern African nation, e.g. : official web sites of Mozambique, addresses of Mozambique`s and foreign embassies, domestic airlines, local news, city- and country guides with extensive travel and tourism information on accommodation, tourist attractions, events and more. Almost five centuries as a Portuguese colony came to a close with independence in 1975. Large-scale emigration by whites, economic dependence on South Africa, a severe drought, and a prolonged civil war hindered the country's development. The ruling party formally abandoned Marxism in 1989, and a new constitution the following year provided for multiparty elections and a free market economy. A UN-negotiated peace agreement with rebel forces ended the fighting in 1992. Other Cities: Beira, Matola, Nampula, Quelimane, Tete, Nacala. Independence: 25 June 1975 (from Portugal). Location: South-eastern coast of Africa, bordering the Mozambique Channel in the Indian Ocean in west. Terrain: Varies from coastal lowlands to high plateau in northwest, mountains in west. Climate: Varies from sub-tropical to tropical (south to north). Population (2005 est. ): 19.4 million. Ethnic groups: Makua, Tsonga, Makonde, Shangaan, Shona, Sena, Ndau, and other indigenous groups, and approximately 10,000 Europeans, 35,000 Euro-Africans, and 15,000 South Asians. Religions: Christian 30%, Muslim 17%, indigenous African and other beliefs 45%. Natural resources: Coal, titanium, natural gas, hydropower, tantalum, graphite. Agriculture products: Cotton, cashew nuts, sugarcane, tea, cassava (tapioca), corn, coconuts, sisal, citrus and tropical fruits, potatoes, sunflowers; beef, poultry. Industries: Food, beverages, chemicals (fertilizer, soap, paints), aluminum, petroleum products, textiles, cement, glass, asbestos, tobacco. Source: Mozambique Investment Promotion Center and others. Ministry of Foreign Affairs and Cooperation (in Portuguese). Permanent Mission of the Republic of Mozambique to the United Nations. Mozambican organization that works to consolidate democracy and promote social justice. 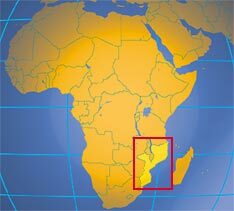 Searchable map/satellite view of Mozambique. Searchable map/satellite view of Mozambique's capital city. The 54 countries of Africa. The official Mozambique News Agency (in Portuguese). Mozambique weekly online (in Portuguese). Leading newspaper from South Africa, covers all Africa with current information. News from Mozambique by World News Networks. State run TV station with news from Mozambique (in Portuguese). State run radio station provides also news headlines. A virtual exhibition in cooperation with the artists' collective Nucleo de Arte. In workshops, members made works of art out of AK 47 machine guns, landmines and hand weapons. Arts and culture of Mozambique provided by the French Mozambican Culture Center Maputo (in French and Portuguese). The Platform of Mozambican Photographers with a photo exhibition about Mozambiquen photography from 1950 to 2001. A project that helps Mozambican children learn about and experiment with photography, improving their chances of receiving scholarships at a university either in Mozambique or abroad. Community site of the province of Zambézia. Mozambican Band, the Good Guys music of Mozambique. Mozambique's investment promotion center, with relevant information. Mozlink offers a a linkages program and assistance for small and medium enterprises (SMEs) suppliers and distributors to cooperate with larger firms' supply chains. IPEX is a non-profit government organisation for the development of Mozambican exports. Independent, non-profit organization dedicated to the promotion of trade and investment between the United States and Mozambique. Mozambique's National Directorate of Mines. The Yellow Pages, Official Phone Guide of Mozambique. An aluminium smelter, the largest industrial project ever undertaken in Mozambique. Discover Mozambique: accommodation, hotels, attractions, festivals, events, tourist boards, biking, skiing, hiking, climbing, cruising, diving, tours and much more. Mozambique for tourists (in Portuguese). Mozambique tourism guide (in Portuguese). UNESCO information about the island. All about the World Heritage site Island of Mozambique. Community site with tourism information about the province of Zambézia. A site dedicated the Moçambique, its people and its wonderful landscapes. The Grande Dame of Maputo. Center of Education and Portuguese Language (in Portuguese). One the first private Universities in Mozambique. Eduardo Mondlane University, founded in 1962 (in Portuguese). Enterprise Forum for sustainable development and environment Moçambique (in Portuguese). FNP a NGO for the conservation of biodiversity and rural development (in Portuguese). WWF Programme in Mozambique supports several initiatives for the conservation of the marine environment, forestry, freshwater, training and environmental education. Site of the Gorongosa National Park. The Histrical Archive of Mozambique (in Portuguese). Mozambique's History (in French and Portuguese). Overview of Mozambique's history by nationalgeographic.com.